Email sent, hopefully in the right format! warren55 wrote: Email sent, hopefully in the right format! Thanks, it was the correct .txt file. I can see that the App and the dongle gets out of sync, causing weird data to be displayed and recorded in the csv-file. langemand wrote: I am focusing my efforts on the stuff that is not easy to accomplish in other ways. The fault codes you can read with one of the lite versions of Torque, so that is not my highest priority. If someone can tell me how (using CAN bus communication) to accomplish things like turning off chimes, setting climate schedule, etc, I will prioritize coding it. I cannot do it without knowing how. 1) Retract electric parking brake when changing the rear pads. 2) Run the electric water pump after changing the coolant to bleed the system. I haven't seen anyone list these CAN commands. They are standard ones that the Kia diagnostic system sends, so maybe someone can capture them from a friendly dealership? I think that's how we got most of the CAN commands. The parking brake one may even be common to ICE Souls. This was done on my car when the OBC was replaced. 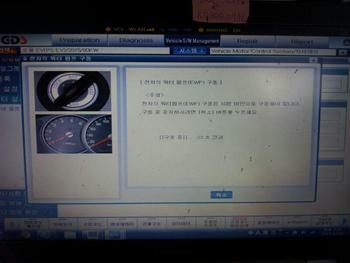 It required the official GDS to be running - and an Internet connection to Kia. 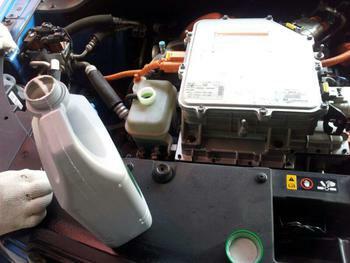 Doing this without bleeding the system means you have to drive a few times, topping up the coolant after each time. Last edited by JejuSoul on Tue Apr 16, 2019 9:45 pm, edited 1 time in total. A value I would like to see added to SoulSpy is Battery Stress = Quadratic average of battery current flow. The RMS is also known as the quadratic mean and is a particular case of the generalized mean with exponent 2. 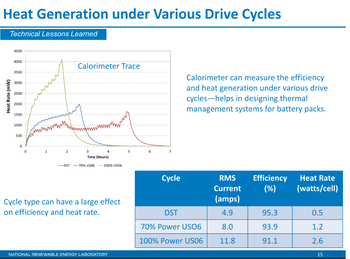 'Battery Stress' is related to lower efficiency, and higher heat in the battery. I believe it is also linked to degradation. warren55 wrote: ... Yesterday I went for a long freeway drive ... I was a little concerned that during that drive my SOH seemed to drop from 107% to 103.7%. That seemed a little drastic to me. langemand wrote: ... I believe the drop came due to multiple top speed driving stints with fast-charging in rapid sequence, on the German Autobahn during the summer heat. Normally the BMS updates the deterioration counters during charging, but occasionally we see extreme jumps in the counters during very fast driving. I believe this is linked to 'Battery Stress'. I should have mentioned that I charged to 100% just before I left that morning, and the weather was quite cool and rainy. It was a long drive for me, but not really a long drive; only about 50 miles before we stopped for breakfast and an L2 charge at the casino. The total drive for the day was 107 miles as I recall, with about 60 miles of that being freeway miles with a max. speed of 60 mph. I really don't think the battery ever had a chance to get over 60 degrees Fahrenheit! I know the outside temp. never got over 50. Warren - I'm assuming your battery stress wasn't caused by really high speeds, but by normal freeway speed up a long, steep incline. Am guessing you drove up from California into the Sierras. The degradation seen during battery stress isn't heat related but power related. Nothing quite that scenic. I went from Tacoma, WA to Shelton, WA to see my sister, about a 200 ft. difference in elevation. There are a few hills in between, but no mountains!